There's no way around it! Drunk texts and calls are only expected on Cinco De Mayo! Fun stuff, for some. Funny custom shot glasses are great for all the bridesmaids to have at the Cinco de Mayo bachelorette party. Have mucho fun and personalize each one with the senorita's name! FIESTA! 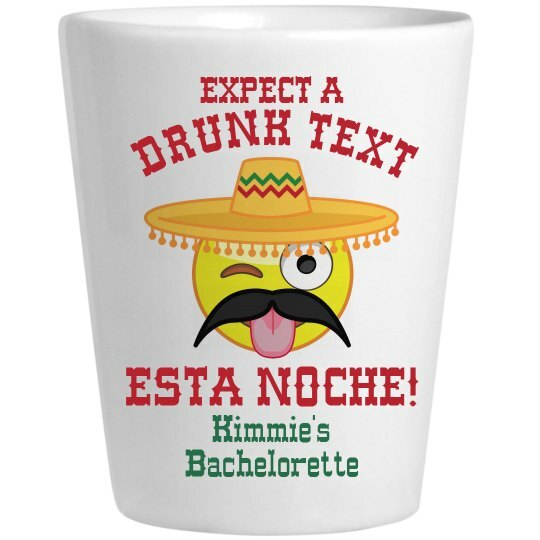 Custom Text: Kimmie's | Bachelorette | EXPECT A | DRUNK TEXT | ESTA NOCHE!